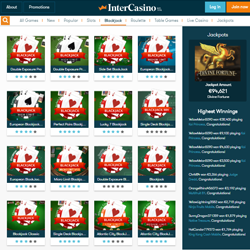 InterCasino is one of the longest-running casinos on the internet, in business since way back in 1996. They have learned a lot in their 12 years online, and have slowly put together a fantastic casino with 200+ games, including seven excellent blackjack variations. The site is fresh and up-to-date, but they like to stick with classic games. Their bonuses are very strong, and some are even blackjack-friendly! 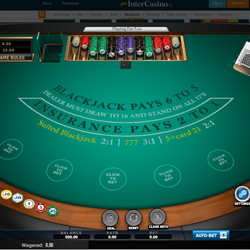 The awesome downloadable casino game suite used by InterCasino was made by CryptoLogic. They put together a package that downloads and installs very quickly and easily, but still looks and runs great. There is a great step-by-step guide on the website if you have any problems getting started. Players can also choose to enjoy their favorite games without downloading a thing, via the instant play version of the casino. It only supports 40 games, but it can be run from any web browser on any computer in the world. The seven blackjack variations found at InterCasino are all classics. As a member, you can play any one of these great games: Single Player BlackJack, Multi-Player BlackJack, Multi-Hand BlackJack, Multi-Split BlackJack, Blackjack Progressive, Pontoon, and Single Deck BlackJack. There are no fancy variations or wacky rules here – just straight-up, on-the-rocks blackjack goodness. It simply doesn’t get better then that. There are over 200 games to choose from at InterCasino, so you should never run out of things to play. They offer many kinds of Video Poker games, a huge variety of slots, plus all your favorite classic vard and vasino games. You will find roulette, craps, baccarat, keno, and more. One of the best features of InterCasino is the ability to create private rooms for several of their games, including blackjack! You can set up a room then invite your friends in to play in an exclusive environment. 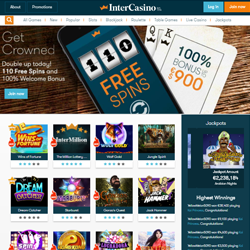 InterCasino is one of those sites that offers a number of different startup bonuses, and players can choose which one they want to participate in. Each different bonus works with different kinds of games – and luckily, there is one that works with blackjack! It gives you a 100% match bonus on your first deposit, up to €500. The playthrough requirement is 60x, and every game except Single Deck Blackjack counts towards that wagering requirement. 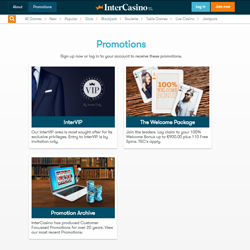 InterCasino runs a Cashback Club which is a great loyalty program that is worth participating in. While InterCasino doesn’t offer an enormous selection of Blackjack games, they have the core variations available, which should be enough for most players. The major benefit to playing here is that they offer Blackjack-friendly bonuses. The playthrough requirements tend to be higher, but at least you can fulfill them by playing blackjack! The loyalty program is also very good, making this a fine casino for blackjack lovers.